Getting a full list of your members is very easy and it’s done using our report features. Start by clicking on the home button then click reports. Once you’re on the reports screen you’ll notice that all of the reports available are listed in alphabetical order. 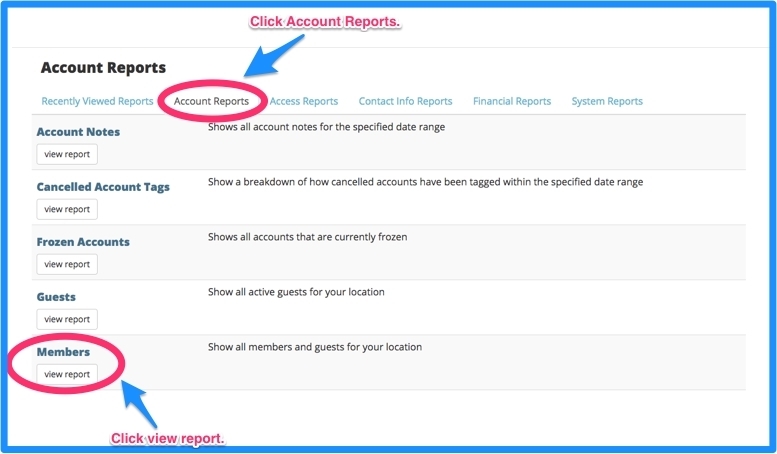 First, click on the Account Reports tab and then simply scroll down and click on the Members report and click view report. With your members report in view you have several options for refining the list of members that’s shown. Select the member account statuses that you’re interested in under the Statuses heading and select the membership account types that you’d like under the Types heading. If you've configured any custom tags, you will also be able to select the tags that you're interested in. Finally, you’ll notice that you can export almost all of your reports using the export buttons at the bottom of the report. If you need a special format such as XML or JSON just let us know and we can enable those export options on your account.